A beautiful Spanish Monterey Floor Plan now available at the prestigious 55+ Trilogy Country Club. Desirable private street and quiet cul-de-sac location makes this a must see property !!! This home offers a nice open floor plan with 2 bedrooms, 2 baths , formal dining room, or can be utilized as a den or office as well, with a total of 1693 square feet. Open concept kitchen with black appliances, gas cook top, granite slab counters, large pantry, built in microwave, and many other custom features including a large kitchen island with a double stainless sink. The gourmet Kitchen overlooks the great room and view of back patio. The master retreat features a spacious bedroom, large bathroom including a stand alone shower, walk-in closet, dual vanity, and linen storage cabinetry. 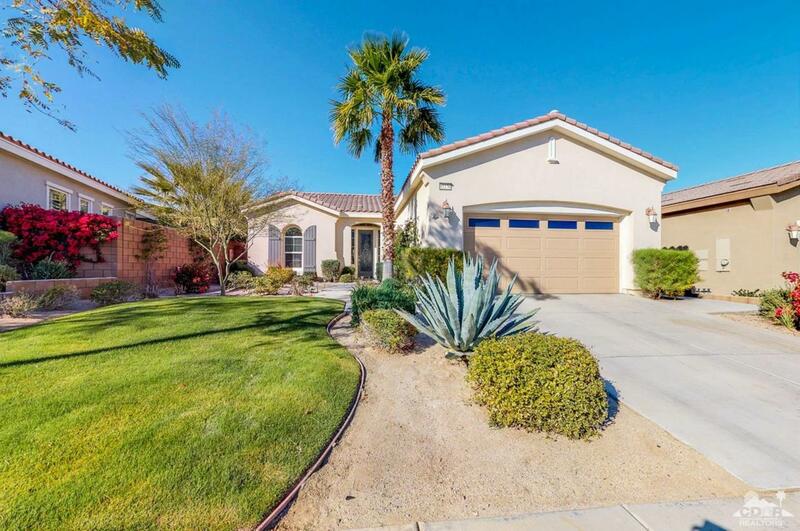 Relax outside in the tranquil backyard patio with beautiful desert landscaping, a large custom covered patio with ceiling fan and outdoor TV. All the custom patio furniture will remain with the home too!! !